The file level download screen allows users to download caption files and transcript files in various formats as well as providing configuration options for SMPTE-based closed caption formats. Click on a file and then click Download. This will bring you to the Download screen. NOTE: These formats may be collapsed after clicking Download. Simply click the Formats to expand. On the right-hand side of the page are all the caption and transcript file formats available within your 3Play Media account. Click the button associated with the format you need and it will immediately download to your computer. 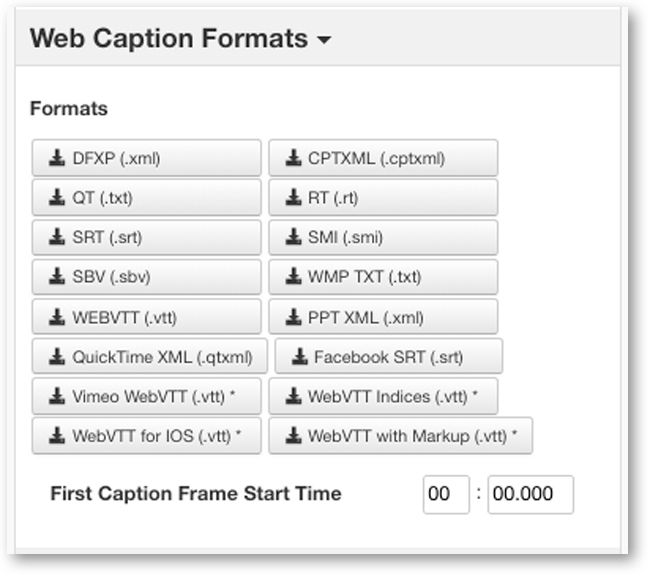 Advanced Options, allows users to customize their SMPTE-based caption formats before downloading them. 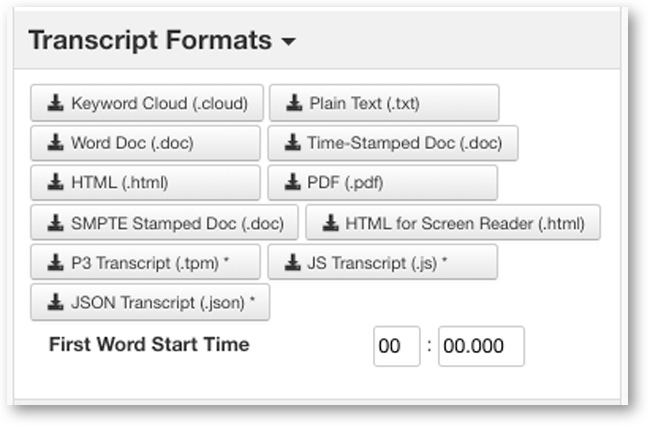 The features include Clip Start Time, Clip End Time, and First Caption Frame Time for Web Formats. For SMPTE Formats, there is Clip Start Time, Clip End Time, SMPTE Starting Timecode, and Frame Rate Settings. Use this feature if you need to extract a specific part of the beginning of caption file. For example, if you need just the first 2 minutes of the captions, you need to enter 00:00.000 for the Clip Start Time, and 02:00.000 for the Clip End Time. If a video that had been transcribed by 3Play Media was then edited after it was submitted for transcription/captioning. For example if you were to add 6 seconds of credits to the beginning of a video that had already been transcribed, you can now start the captions 6 seconds later than on the original time code to compensate for the credits that were added to the beginning of the media file. The changes made are not permanent, and will revert back to normal, once you exit the Download screen. 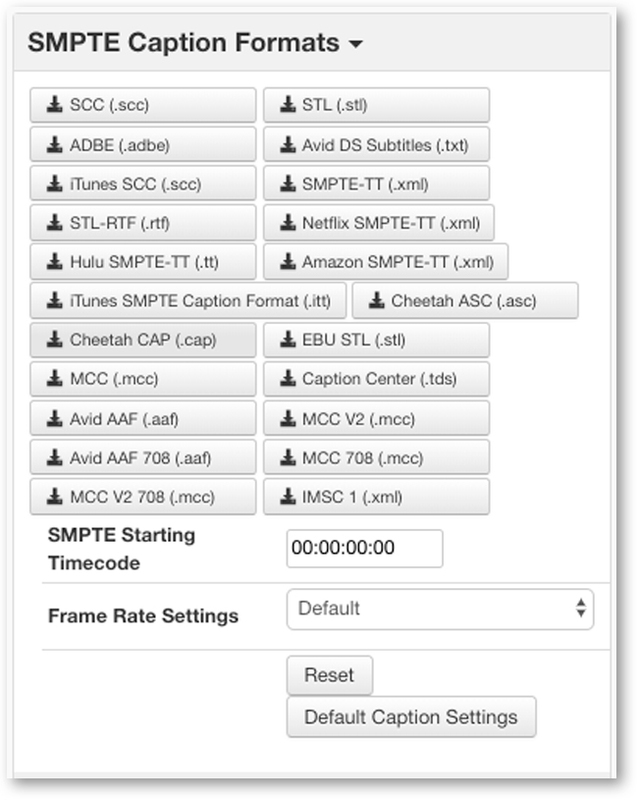 Use SMPTE Starting Timecode, for SMPTE based caption formats. The frame rate settings can also be modified as well, and these changes are also not permanent. Note: The custom Start and Stop times can only help if any edits have been made to the the beginning of a video. If edits have been made in the middle or the end of a video, this method will not work/help. Enter a custom SMPTE timecode. The value entered here will be the starting time for any of the SMPTE based formats downloaded from this page. Select a frame rate that will be applied to your SMPTE-based CC formats. Select from 24, 25, 29.97df, 29.97ndf, and default. 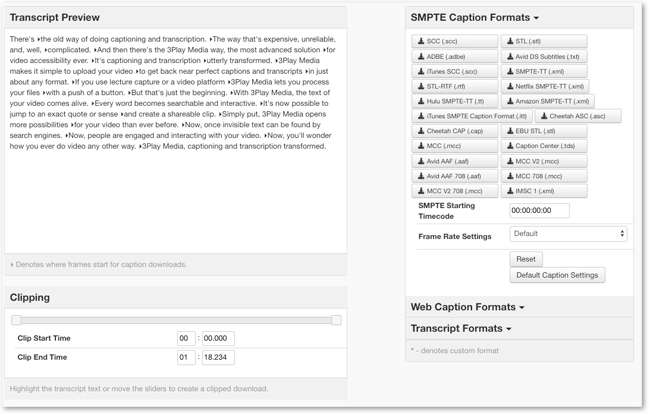 Note - Only the SMPTE based caption formats, can the frame-rate be changed. 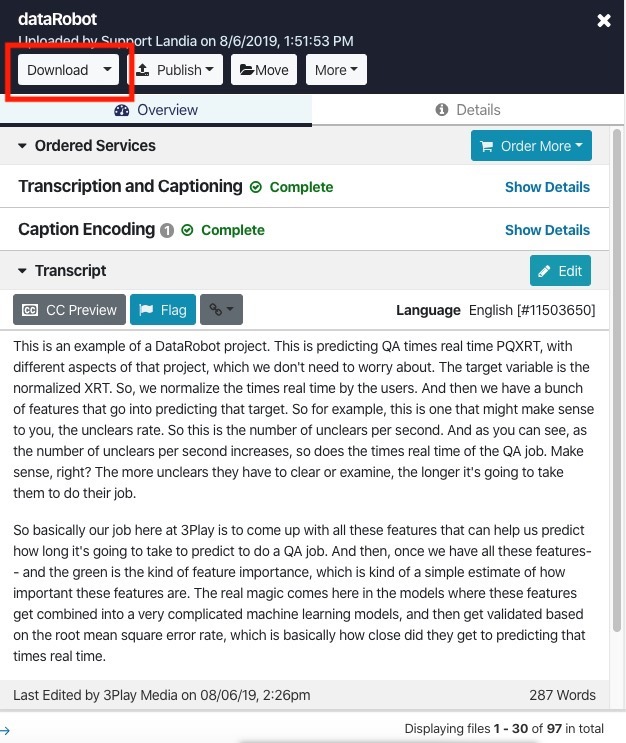 Once you have entered your custom Start and/or Stop time(s), click on the caption format to start the download.